The ride begins at the beach but soon turns inland, where resorts and homes are left behind. The undulating trail passes rock formations adorned with cactus and scrub, then turns into a wooded thicket. Ahead, sunlight sparkles on the surface of a hidden lagoon where flamingoes wade in the shallows. This is a side of the island of Curacao that can't be seen from the road and is reserved for those who are willing to travel under their own power, pedaling a modern mountain bike through a wild landscape. Also awaiting riders are historic sites and water views, followed by a refreshing dip in the Caribbean. The most popular location for off-road biking on Curaçao is on the eastern end of the island, in low hills that surround the wetlands of the Jan Thiel Salt Pans. This area, which is now a nature reserve, is characterized by its rare vegetation and exceptional bird life. Trails of varying length wind through the reserve and extend to the shores of the adjacent lagoon known as the Spanish Waters. Because the Jan Thiel Nature Reserve is home to many unique and rare plants and animals, riders are expected to follow posted routes to avoid disturbing any fragile breeding grounds. For this reason, it is best to join guided rides, as group leaders know the appropriate trails. The Jan Thiel Trail passes through a nature reserve that is home to rare vegetation and numerous species of birds. A ride to the salt flats rewards with views of the island's largest flamingo colony. A peddle to the Caracas Bay Peninsula passes by the intact remains of historic Fort Beekenburg, the restored dwellings of Landhuis Jan Thiel and colonial-era salt pan structures. Specialty bike shorts add comfort but aren't required. Shoes with firm soles for peddling support. Sunscreen and sunglasses. A fanny pack for personal items such as cameras. A swimsuit and towel for beach time after the ride, and a credit card or cash for lunch and shopping. 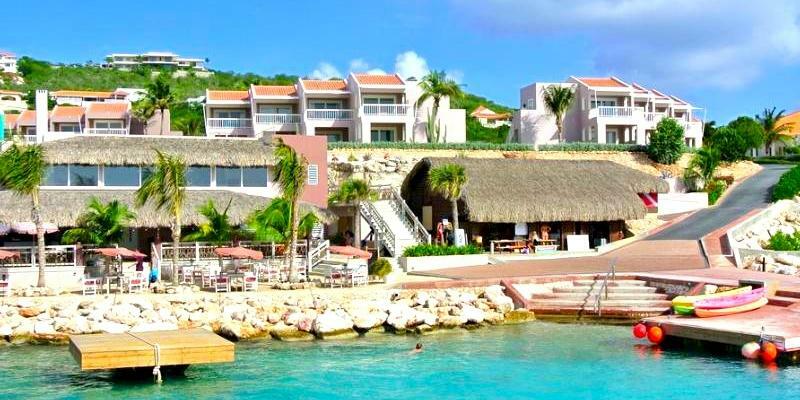 MAMBO BEACH - CARADONNA RECOMMENDS includes 7 night Deluxe Garden View accommodations, Bonito Curacao cultural tour; Duration approx 4.5 hours, animal encounters snorkel, Jan Thiel Mountain Bike Adventure includes a guided caravan style adventurous experience. Off roading the Jan Thiel trail, salt flats, old slave walls, swim stop, Caracas Bay Peninsula Island, Fort Brekenburg. (dur 3 hrs; start time 9:30am), ATV Eastern Island Off Road Adventure Tour including helmet, goggles, drinks and a CD with pictures. Duration approximately 3.5 hours; daily departures at 9am or 2pm, breakfast, lunch and dinner daily, snacks, and beverages including alcohol, $200 per room resort coupons, scheduled entertainment and activities, non-motorized watersports, roundtrip airport transfers, hotel tax and service charges. Valid 4/21/19-6/22/19. Book by 4/30/19. BUILD YOUR OWN PACKAGE includes 7 nights accommodations, free WiFi, complimentary shuttle to Willemstad, roundtrip airport transfers, hotel tax, and service charges. Options to add-on Cultural Tours, Offroading Adventures, Snorkel and AnimalEncounters and Biking Tours. MAMBO BEACH - BUILD YOUR OWN PACKAGE includes 7 night Deluxe Garden View accommodations,breakfast, lunch and dinner daily, snacks, and beverages including alcohol, $200 per room resort coupons, scheduled entertainment and activities, non-motorized watersports, roundtrip airport transfers, hotel tax and service charges. Options to add-on Spa Package, Cultural Tours, Animal Encounter Snorkel Trips, Biking Adventures and Offroading Tours. ST. MARIE - Stay in a paradise and discover the Curacao at Oasis Coral Estate Beach, Dive Wellness Resort. A unique and luxurious resort away from the crowd. The resort is a hideaway where visitors are able to relax because it is undiscovered by the masses. You will surely gain an unforgettable experience here. The Oasis Coral Estate Centre is the beating heart of the resort. You will instantly feel relaxed just by being here. The Centre offers luxurious facilities on a beautiful location namely, an infinity pool, Spa & Wellness, diving centre Coral Divers, rooftop bar “Koraal” and restaurant “Karakter”. 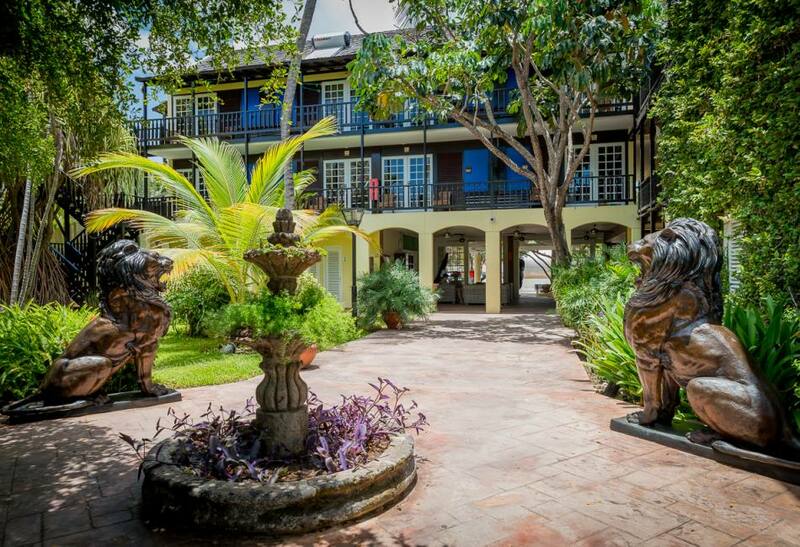 SCHARLOO - This boutique hotel is located right next to the ocean and within walking distance to many tourist attractions including the Queen Emma Pontoon Bridge and the floating market. Hotel rooms and apartments have been restored and renovated without compromising its unique heritage and charm. Scuba Lodge also features an oceanfront restaurant and bar, two swimming pools, and a PADI-certified dive shop. There is a bus stop in front of the hotel and offers parking for guests. Lions Dive is named one of the top 10 Caribbean dive resorts. Located on a beautiful white sandy beach, featuring Ocean Encounters, a PADI Five-Star IDC, and near historic downtown Willemstad. 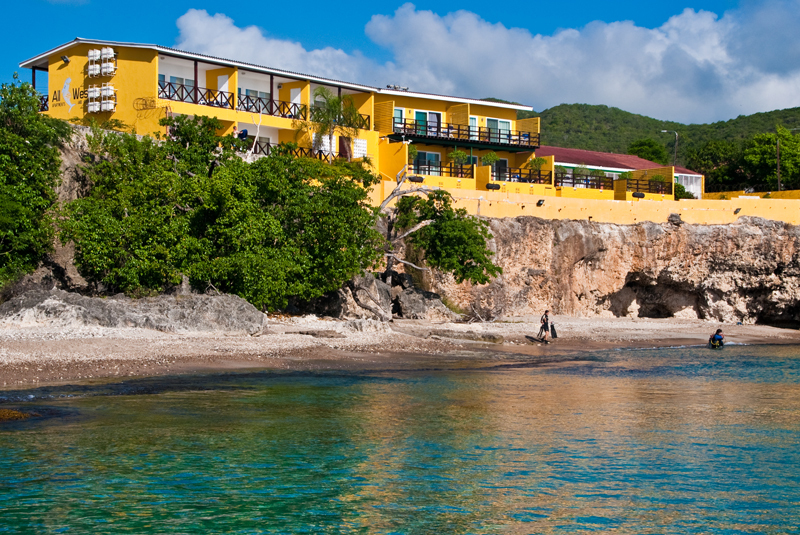 Lions Dive & Beach Resort Curacao has recent upgrades, renovations and a friendly, charming and sporty demeanor. WESTPUNT - All West is surrounded by the tropical hills, and is ideal for catching spectacular sunsets and gazing at the fantastic star filled skies. All West has twelve fully equipped apartments with ocean views, and the beach below the apartments is great for swimming, snorkeling and shore diving. MAMBO BEACH - Sunscape Curaçao Resort, Spa & Casino located just 10 miles from the Curaçao International Airport - Hato and 2 miles from the culturally diverse capital city Willemstad – a UNESCO World Heritage site – with its distinctive architecture, museums, monuments and world-class shopping. This beautiful 1,500 ft. beach front Resort, with 341 spacious guest rooms and suites is right in front of the National Underwater Park and situated at one of the most developed tourist beach sites and has the most popular Casino onsite. Entry Requirements: A valid passport is required for U.S. Citizens with at least one blank page for passport entry stamp. No visa is required for entry. Vaccinations are not required for entry into Curaçao. Check with your doctor and the Centers for Disease Control on recommended vaccinations for travel at www.cdc.gov. Blessed as one of the best natural harbors in the southern Caribbean, Curaçao has long been a regional crossroads not only for goods but also for people. This has resulted in a cultural fusion that includes more than 40 ethnic groups, each enriching the mix. Though Dutch is the official language, English is widely spoken and many islanders converse in Papiamentu, a dialect created from mixing of Portuguese, Spanish, Dutch, and several African languages. The capital city of Willemstad is one of the oldest settlements in the Caribbean, dating back to the Dutch capture of the island from the Spanish in the early 17th century. Thanks to the well-protected harbor of St. Anna Bay, the town quickly grew into a busy trading port, and the seat of government for the Netherland Antilles. Today, most of the original colonial-era architecture survives and is recognized as a UNESCO World Heritage site. The oldest part of the city, known as the Punda district, has always been Willemstad’s main shopping area. Here, pedestrian-only streets and narrow alleys create a picturesque atmosphere, full of life and color. Unique boutiques offer a diverse selection of European clothing, French perfumes, Japanese electronics, Irish crystal, English china, fine Italian leathers and Chinese embroidery, while sidewalk cafes serve up a tasty mix of island favorites and international flavors. Noteworthy landmarks include Fort Amsterdam, the Mikve Israel- Emanuel synagogue, which is the oldest in the western hemisphere and the Queen Emma floating bridge, a pontoon bridge. The Museum Kura Hulanda focuses on the slave trade, while the Maritime Museum recounts the island's nautical traditions. No visit is complete without a stop off at the floating market, where a colorful array of fruits and vegetables make their way from the nearby shores of Venezuela aboard small island trading vessels. Electricity in Curaçao is 127/120 volts at 50 cycles and they use 2 prong plugs, so most appliances made in the USA will work well and should not require an adapter. Curaçao's country code is 5999 with a 7 digit local phone number following the country code. UTS and CT are a few of the local companies providing phone and internet service. Check with your provider to see what plans are available or you will be subject to roaming charges. Many hotels and restaurants offer WiFi. The water quality from the tap is safe to drink according to the ADC (Analytic Diagnostic Center). Bottled water is also readily available for purchase. Dutch is the official language, while Papiamentu is the most commonly spoken language. English and Spanish are all widely spoken and understood. Papiamentu is a form of Creole indigenous particularly to Bonaire, Curaçao, and Aruba, where it is considered the national language. You'll sound like a pro if you say 'Bon Dia' (Good Morning) or "Danki" (Thank you) to the locals. Curaçao is on Atlantic Standard Time (AST) and does not observe Daylight Savings Time. Curaçao is 4 hours behind Greenwich Mean Time (-4 GMT). Curaçao is an island located in the Southern Caribbean Sea. Curaçao is 42 miles east of Aruba, 30 miles west of Bonaire and approximately 40 miles north of South America. The island of Curaçao is 37 miles long and 8 miles wide with an area of 171 square miles. The population of Curaçao is 158,635 (2016).